Varanasi is built on the banks of the Ganga (Ganges) river. Both the river and the city are considered sacred by Hindus. It is the goal of every Hindu to visit Varanasi at least once in their lifetime. The most distinguishing feature of the city is its ghats - tall stone steps that lead down to the river. They are the hub of religious and social activity. Thousands of pilgrims visit the city each day, to bathe in the river, to make offerings to the gods, and to bask in the divine light that is said to come from the many temples that line the river — hence its name, The City of Lights. The 100 or so ghats run for some four miles along the river. Different sections of the ghats are designated for different activities- some for bathing, others for laundry, others for washing cattle, although many are used for multiple activities. 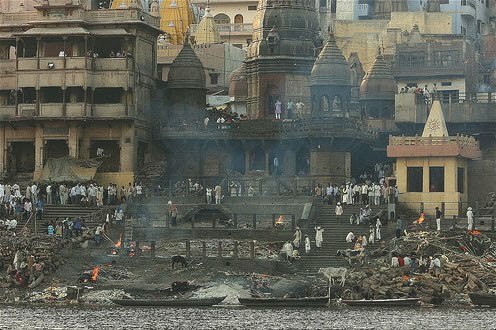 Perhaps the most extraordinary activity that takes place along the ghats is the public cremation of bodies. There are numerous such funeral pyres along the ghats. The one above was a small one, with only one or two pyres going at any one time. The one in the image is the main burning ghat, where a dozen or so cremations happen at any time. Bodies are burned non-stop, all day and all night, several hundred each day. Each one is wrapped in a white muslim cloth and placed in its own stack of wood. It takes 2-3 hours for the body to be reduced to ashes. Relatives (males only) watch the process. Hindus believe that if you die in Varanasi, you are guaranteed release from the birth and rebirth cycle. Being cremated in Varanasi is considered a desirable thing. The name of Dasaswamedh Ghat indicates that Brahma sacrificed (medh) 10 (das) horses (aswa) here. Conveniently central, it’s one of the most important and busiest ghats and therefore is a good place to linger and soak up the atmosphere. Note its statues and the shrine of Sitala, goddess of smallpox. Tulsi ghat is named after the famous 16th century poet Tulsidas, who spent many years here composing the Ramcharitmanas. His manuscript, it is said, floated instead of sinking in the Ganga. The first performance of Ramlila was held here. A temple of Ram stands on the ghat. The house in which the poet died preserves his samadhi, his wooden clogs, pillow and the idol of Hanuman which he worshipped. There is also a piece of wood from the boat used by him to cross the Ganga. Kedar Ghat built by the Maharaja of Vijayanagar in the South is named after Shiva, who dwells in the middle of the spacious temple.This ghat is shrine popular with Bengalis and south Indians. A little below is the Gauri (Parvati) kund whose waters have healing properties. Mansarowar Ghat was built by Raja Man Singh of Amber and named after the Tibetan lake at the foot of Mt. Kailash, Shiva’s Himalayan home. Manikarnika Ghat,one of the oldest and most sacred in Varanasi. Manikarnika is main burning ghat and one of most auspicious places that a Hindu can be cremated. Bodies are handled by outcasts known as doms, and they are carried through alleyways of old city to the holy Ganges on a bamboo stretcher swathed in cloth. The corpse is doused in Ganga prior to cremation. You will see huge piles of firewood stack along the top of the ghat, each log carefully weighted on giant scales so that the price of cremation can be calculated. There are no problems watching cremations, since at Manikarnika death is simply business as usual, but don’t take photos and keep your camera well hidden. Dattatreya Ghat bears the footprint of Brahmin saint of that name in a small temple nearby. Panchganga Ghat as its name indicates, is where five rivers are supposed to meet. Dominating the ghat is Aurangazeb’s smaller mosque, also known as the Alamgir Mosque, which he built on the site of large vishnu temple erected by the Maratha chieftain Beni Madhav Rao Scindia. This ghat was built in 1600 but was poorly restored in the 19th century. The northern corner of the ghat has a fine stone balcony and Raja Jai Singh of Jaipur erected one of his unusual observations on this ghat in 1710. The Harishchandra Smashan Ghat is a secondary burning ghat. It is one of the oldest ghats in city. The Assi Ghat is one of the five special ghats which pilgrims are supposed to bathe at in sequence during the ritual route called Panchatirthi Yatra. The Trilochan Ghat has two turrets merging from the river, and was water between them is especially holy. The Bachraj Ghat is a Jain and there are three riverbank Jain Temples. Many of ghats are owned by Maharajas or other princely rulers, such as the very fine Shivala Ghat owned by the maharaja of Varanasi.